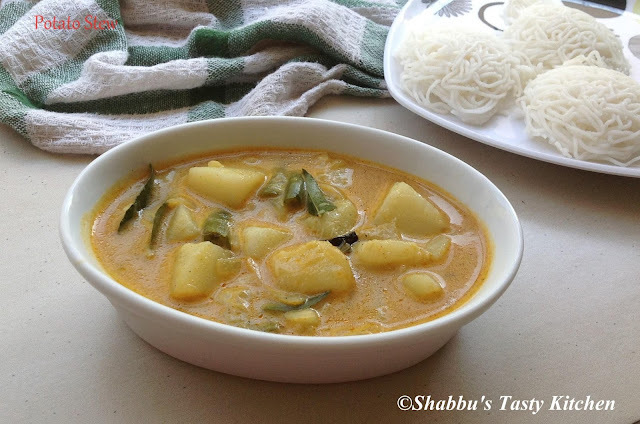 In a bowl, add the rice flour, grated coconut, chopped onion, green chillies, ginger, curry leaves and salt and mix well. Add water little by little to this and knead to a soft and moist dough. Take a small amount of dough and gently flatten using your fingers. Remove the seeds from the jackfruit pieces and chop them into pieces. Then pressure cook it with half a cup of water for 4-5 whistles on medium flame. 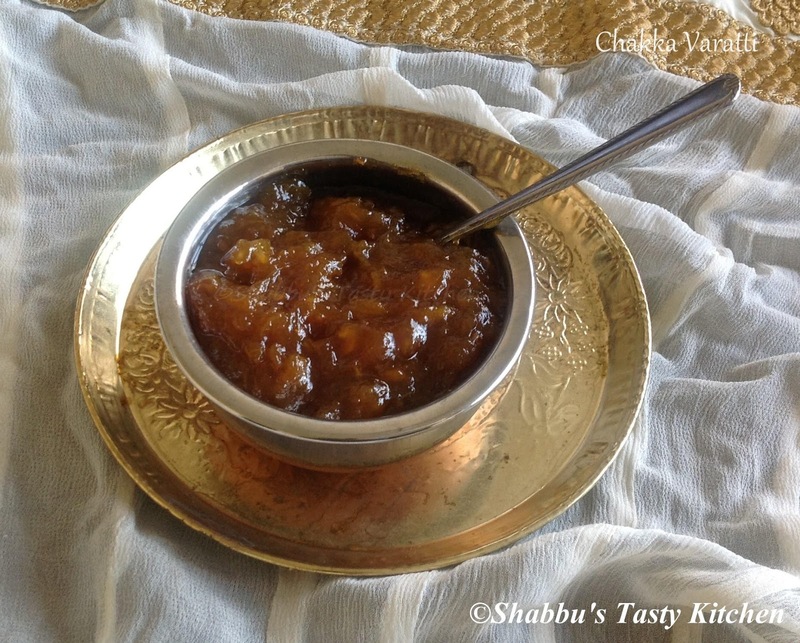 Meanwhile melt the powdered jaggery with half a cup of water in a pan to get a thick syrup. Strain the syrup and keep it aside. Once the pressure releases, open the cooker and mash the cooked jackfruit with backside of a wooden spoon/ ladle as a paste (or grind it to a smooth paste). Then keep the pressure cooker on the flame ( or transfer it to a heavy bottomed pan ) and allow to evaporate the water by stirring. Pour the strained jaggery syrup to this and allow to cook stirring continuously till it becomes thick and jam like consistency. 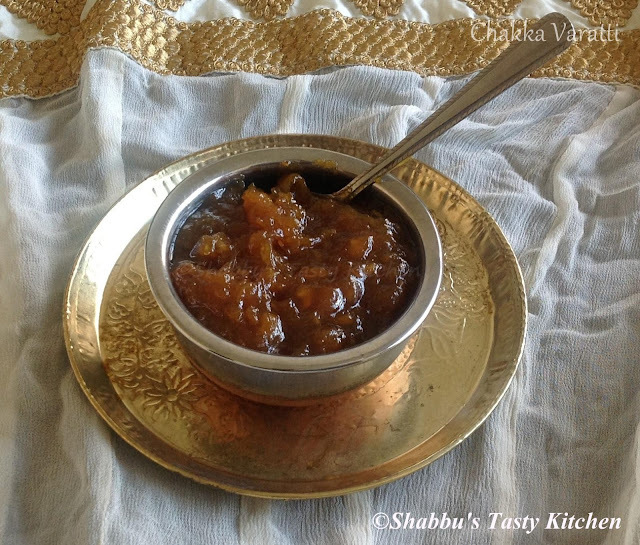 When the water content is almost evaporated, add ghee little by little and keep stirring until the mixture leaves the sides. Add the dry ginger powder and cardamom powder and mix well. Remove from the flame and let it cool to the room temperature. Store in an airtight container and refrigerate..
Heat oil in a splutter mustard seeds. Add chopped onion, green chillies, garlic and curry leaves and saute well. Add sprouted green gram, grated coconut, cumin seeds, turmeric powder and salt and mix well. Sprinkle 3-4 tbsp of water. Cover and cook on low-medium flame for about 10 minutes, stirring in between, until done. Peel and chop the cucumber into fine pieces. Add little salt to this and keep it aside for 10 minutes. In a large bowl, add the yoghurt and stir well. Add chopped ginger, cumin powder, coriander leaves and a pinch of salt and mix well. Add the finely chopped cucumber to this and mix well. 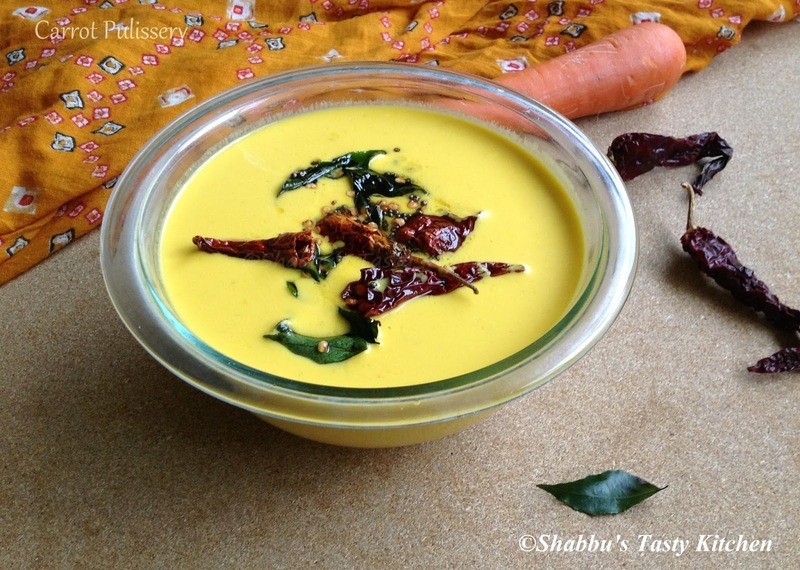 Serve this raita with biriyani, pulao etc. Clean and cut squid into round pieces and marinate it with chilli powder, turmeric powder and salt and keep it aside for 15 minutes. Heat oil in a pan and fry the marinated squid pieces and keep it aside. Heat oil in a pan and add 3 sliced onions and saute well till transparent. Add crushed green chillies and ginger-garlic paste and saute well. Add chopped tomatoes to this and saute till soft. Add chopped mushrooms and cook covered on low flame for 8-10 minutes. Add yoghurt and 1 tsp garam masala to this and mix well. Then add fried squids and mix well. Add chopped coriander leaves, mint leaves and lemon juice to this, mix well and remove from flame. To prepare the rice, heat ghee in a wide thick bottomed pan, add cardamom, cinnamon, cloves,bay leaf and 1 sliced onion and saute till transparent. Add drained rice and saute for 2-3 minutes in low-medium flame. To this add boiling water and salt and cook till rice is done at low flame. Remove from the flame. 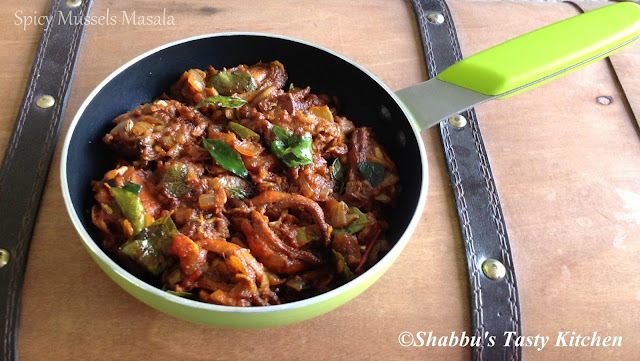 To layer the biriyani, take a wide thick bottomed pan and apply some ghee. Layer the bottom of the pan with half of cooked rice. Add little garam masala and coriander leaves and then add prepared squid - mushroom masala over the rice and then add remaining rice as a top layer. Sprinkle little garam masala and add coriander leaves and a pinch of yellow food colour /saffron mixed with 1 tbsp lemon juice/ milk.on top. Add sliced onion, crushed garlic and green chillies and saute till onion turns transparent. Add dried prawns, chilli powder and turmeric powder and stir well for few minutes. Then add chopped cheera and salt, mix well and cook covered on low flame until it is almost dry, stirring occasionally. 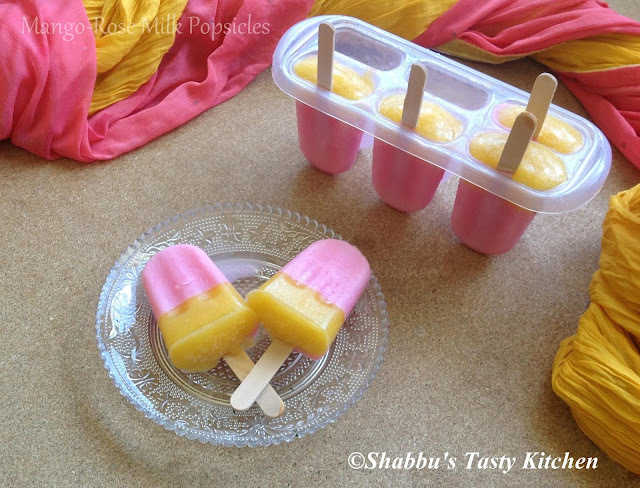 Peel and chop mango into small cubes and mix this with 2 tbsp of grated coconut and 1 tsp of sugar and keep it aside. To prepare puttu, take a puttu maker ( I used chiratta puttu maker) and layer it with 1 tbsp grated coconut first, then 1- 1 1/2 tbsp mango mix and then add the puttu podi . Top it with another layer of mango mix and some grated coconut. Cut mushrooms into pieces and keep it aside. Chop potatoes into small cubes. Add sliced onion, crushed ginger, green chillies and curry leaves and saute well. Reduce the flame and add turmeric powder and mix well. Add coriander powder and chilli powder and saute for 2 minutes. Add chopped tomato and salt and mix well. Then add chopped potatoes, mix well and cook it covered on medium flame for about 5 minutes. Add chopped mushrooms and coconut milk and mix well. Turn the flame to high and add 1 tsp garam masala and cumin powder and mix well. Adjust the salt and then cook covered till the potatoes and mushrooms are cooked and the gravy thickens. Preheat oven to 170 degree celcius. Butter a 9 by 3 inch loaf pan and line it with baking paper. Sift together all purpose flour, baking powder and salt in a bowl and keep it aside. In a bowl, mix together milk and vanilla essence and keep it aside. In a large mixing bowl or in the bowl of an electric mixer, add butter and beat on medium speed until it becomes light and fluffy. Add the sugar and beat on medium high speed for 4-5 minutes until the mixture becomes creamy, pale and light. Add the egg and beat on medium high speed for 1 minute until the egg is completely combined. Then add flour in 3 parts and milk mixture in 2 parts, beating until just combined after each addition, starting and ending with the flour. Pour the batter into the prepared loaf pan and level the top. Bake it in the preheated oven for 15-20 minutes or until the toothpick inserted into the centre of the cakes comes out clean. Cool on wire rack for 10 minutes. Cling wrap the cake and freeze for few hours. In a heavy bottomed saucepan (non stick pan), add the sugar and keep over medium flame. Do not use spoon or spatula. Keep swirling the saucepan using the handle of the pan to avoid burning of sugar. Keep removing it off the flame until sugar dissolves and do not let it smoke. Wait until the caramel colour becomes deep, but not burnt. Do this step with care, until the caramel gets to the right colour and sugar is also all melted. Remove the caramel from heat, and pour the cream gently in a slow stream, a little at a time and keep stirring as you add the cream. Care should be taken in this step - if you add all the cream together, the caramel would crystallize. Add the butter and salt and keep the caramel back on low flame and keep stirring until butter is fully melted. Then increase flame to medium and keep stirring for 4-6 minutes to thicken up the sauce. Remove from the flame and let cool completely. Line up the loaf pan with butter paper/ baking paper hanging from either sides. Place the vanilla loaf into this prepared loaf pan. 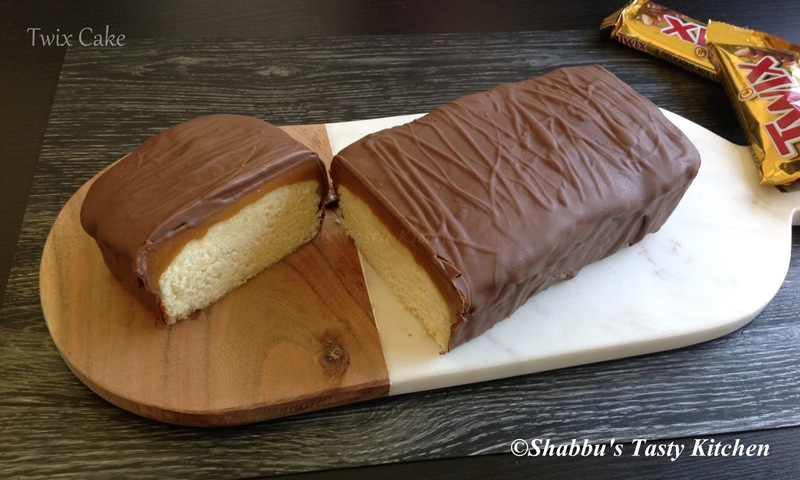 Pour over the caramel sauce on top of the cake. Level the top using an offset spatula and freeze it for 2 hours. 4. Lift the set cake by pulling out the butter paper hang. Place the cake on top of a wire rack with a baking tray underneath. 5. Melt the chocolate by using a double boiler or in a microwave. 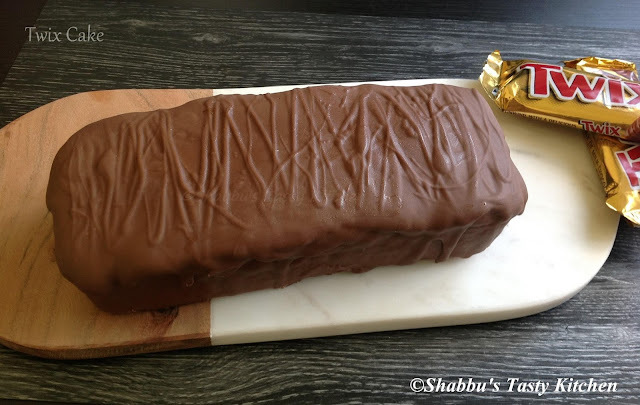 While its not very hot, pour over the cake to cover completely on top and all sides of the cake. In a blender, add the chopped persimmon, strawberries, chilled milk and sugar and blend well until smooth and creamy. Clean the mussels and marinate it with the above marination ingredients and keep it aside for 10-15 minutes. Heat oil in a pan and add the marinated mussels, mix well and cook it for 7-10 minutes or till it is well cooked. Remove the mussels into a plate leaving the masala / juice in the pan. Heat this remaining masala / juice in the pan and add cinnamon, cardamom and fennel seeds and cook for a minute. Add the chopped onion, green chilli and curry leaves and saute for 5 minutes till it tuns golden. Add chilli powder, coriander powder, turmeric powder, garam masala, pepper powder and salt and mix well for a minute. Add the chopped tomatoes to this , mix well and cook it covered on low heat for 5 minutes or till it turns soft. Then increase the flame and add little water to this , mix well and cook for 2 minutes till the oil separates. Heat oil in a pan and add chopped onions, ginger, garlic and green chillies and saute well till onion turns transparent. Add turmeric powder, chilli powder and garam masala and mix well on low flame. Then add chopped potatoes and salt, mix well and cook it adding enough water. When potatoes are cooked, add thin coconut milk, pepper powder and curry leaves and boil it for 5-7 minutes. In a pan, add the chopped spinach and saute for 2-3 minutes or till the raw smell disappears.Then grind it to a smooth paste adding little water and keep it aside. Grind grated coconut, ginger and green chillies together to a fine paste. Then mix this ground paste with yoghurt. Add chopped tomato, salt and spinach paste to this coconut- yoghurt mixture and mix well. Heat oil in a small pan and splutter mustard seeds. Add urad dal, dry red chillies and curry leaves and fry. Puree the blueberries adding lemon juice, enough sugar and 2 tbsp water in a blender until very smooth. 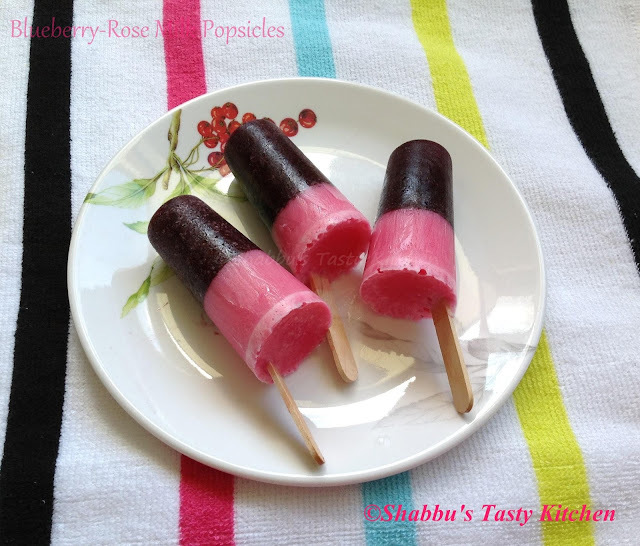 Fill popsicle moulds halfway with this blueberry puree and freeze it for 1 hour. In a bowl, add milk and enough sugar and mix well till sugar dissolves. Add rose milk mix to this and stir well. ( or blend milk, sugar and rose milk mix together)..
Wash and chop the kovakka into pieces. Heat 1 tbsp oil in a pan and splutter mustard seeds. Add curry leaves and crushed garlic and fry. Add turmeric powder and salt, mix well and cook covered at low flame till done, stirring occasionally. (Sprinkle little water if required). Peel and chop beetroot into small pieces and grind it in a blender adding about 3/4-1 cup of water. Strain its juice and keep it aside. 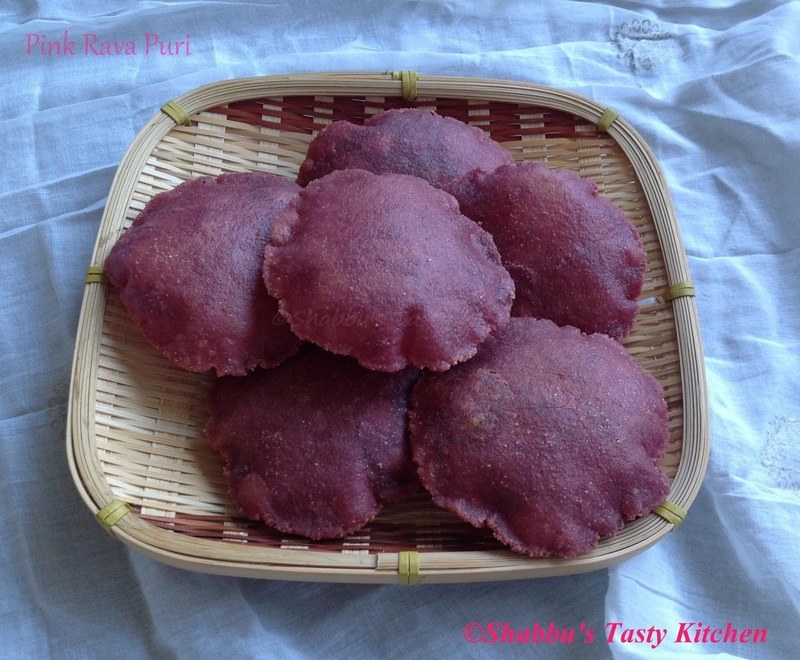 In a bowl, add rava, plain flour, ghee and salt and knead it well adding enough beetroot juice to make a soft dough. Keep it aside for 30 minutes. Cook the chicken with 4 cups of water adding little pepper powder and salt. Shred the chicken pieces and keep it aside. Heat olive oil /butter in a pan on medium heat and add grated carrots and crushed garlic and saute for about 10 minutes till soft and have changed the color. Add diced onion to this and saute well till soft. Add plain flour and saute till the raw smell disappears on low flame. Add parsley and mix well. Add chicken stock slowly, stirring continuously to avoid lumps and let it simmer for 10-12 minutes. Allow it to cool and then grind it to make a puree using a blender. Transfer this puree back to the pan and add the shredded chicken pieces, mix well and cook for 2-3 minutes. Make a smooth paste of paneer using a blender/ food processor and keep it aside. Mix plain flour , baking powder and a pinch of salt in a bowl and keep it aside. In a bowl, beat the eggs using a beater until fluffy. Add sugar to this and beat until the sugar dissolves. Add smooth paneer paste and beat well. Then add the flour mixture and mix well. Add the milk and beat/ whisk well to a thick batter. Heat a non stick frying pan/ skillet over low heat and grease lightly with butter. Pour a ladle of pancake batter onto the hot pan. Cook for 2-3 minutes or until bottom of the pancake is brown and bubbles form on the surface. Turn over and cook for 1-2 minutes until the pancake turns golden brown. Repeat with remaining batter, brushing the pan with melted butter. Cut each hard boiled egg into 8 pieces and keep it aside. In a bowl, add the beaten egg, 1 1/2 tsp corn flour, 1 tsp soy sauce, 1/2 tsp chilli powder and salt and mix well. Marinate the cubed egg pieces in this paste and keep it aside for 20 minutes. Heat oil in a pan and shallow fry the marinated eggs and keep it aside. ( Here I fried only half of the egg pieces and the remaining egg pieces used as it is). In the same pan, add the chopped ginger, garlic and green chillies and saute for a minute. Add diced onions and capsicum and saute till they are soft. Add crushed black pepper, tomato sauce, soy sauce, chilli sauce and salt and mix well. Then add the egg pieces and toss it well for 2 minutes. Mix 2 tsp corn flour in 3/4-1 cup of water, add it to the eggs and cook for 4-5 minutes on medium flame. 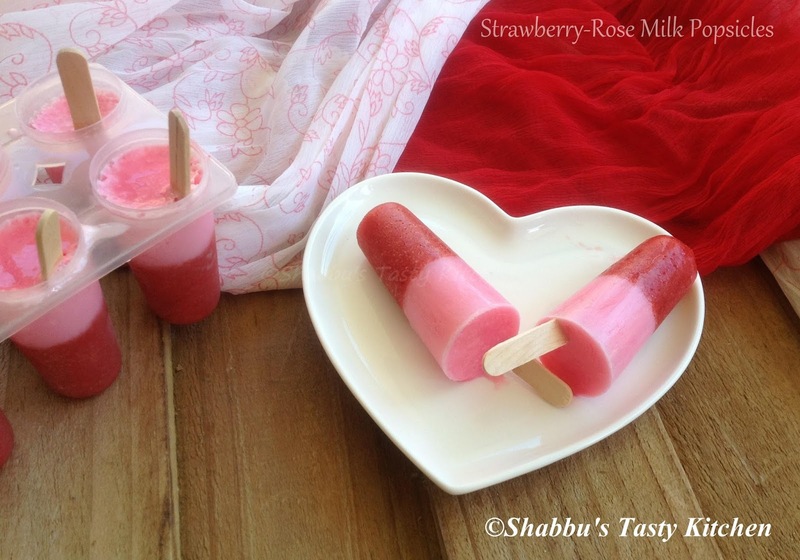 Fill popsicle moulds halfway with this rose milk and freeze it for 1 hour. In a blender, add the cubed mango and enough sugar and puree it adding little water until smooth. In another mixing bowl, add sugar, yoghurt, orange juice, oil and orange zest and whisk well until everything is well combined. Make a well in the centre of the dry ingredients (step 2) and add the wet ingredients (step 3) and mix with a spatula until just combined. Do not over mix. Spoon the batter into the prepared muffin tin and bake for 15-18 minutes or until lightly golden golden and a skewer inserted comes out clean. Clean the whole chicken both inside and outside and make slits over the thicker parts of the chicken. In a bowl, add chilli powder, turmeric powder, garam masala and salt and make a thick paste adding little water. Apply this paste all over the chicken both inside and outside and keep it aside. To prepare the stuffing, heat 2 tbsp oil in a pan and add sliced onion and saute well adding little salt. Add chilli powder, coriander powder, turmeric powder and garam masala and mix well. Add coriander leaves and mint leaves and mix well. Add cooked chana dal to this and mix well for a minute. Then add boiled eggs and mix well. Switch off the flame and transfer this stuffing to a plate. Stuff the chicken with this filling- first insert the egg into the cavity and then the filling , taking care not to over stuff. Then tie the chicken's legs and the wings properly using a kitchen twine. In a large pan, heat 2 tbsp oil and add crushed ginger, garlic and green chillies and saute for a minute. Add sliced onions and saute well adding little salt. Add chilli powder, coriander powder, turmeric powder and garam masala and saute well till the raw smell disappears. Add 1/4 cup boiling water to this and mix well. Now place the stuffed chicken into this masala and cover the chicken with the masala. Cover and cook at low flame for about 20 minutes. Then open the lid, turn over the chicken and cook covered for 10 minutes. In the meantime, heat 1 tbsp oil in a pan and roast grated coconut, fennel seeds and dry red chillies together till golden brown. Then grind it to a paste and adding 2 tbsp water. Add this paste to the cooked chicken, mix well and boil for 3-4 minutes at high flame. Switch off the flame and transfer carefully to a serving plate and top it with masala.. Garnish with coriander leaves and serve.. In a pan, add cubed carrots and cook it adding 1 1/2 water till soft. Allow it to cool and then grind it along with its cooked water to a smooth puree and keep it aside. Grind grated coconut, green chillies and cumin seeds together to a smooth paste adding little water and keep it aside. In a large pan, add carrot puree, ground coconut paste and salt and mix well. Add water according to your consistency and heat well, stirring continuously. Don't allow to boil. Switch off the flame and transfer to a bowl. Allow it to cool and then add beaten yoghurt and mix well. In a bowl, add the chopped strawberries, jalapeno, onion, coriander leaves. salt, lemon juice and sugar. Wash and soak the rice in water for 10-15 minutes, drain it and keep it aside. Heat 1 tbsp oil and 1 tbsp ghee in a pan and fry the paneer cubes till light brown on both sides and keep it aside. In the same pan, add the chicken pieces, chilli powder, coriander powder, turmeric powder, garam masala and salt and mix well for 3-4 minutes. Add fried paneer to this and mix well for a minute and remove from the flame. Heat little oil and ghee in a pressure cooker and add cinnamon, cloves and cardamoms. Add sliced onion and saute well till transparent. Add ginger-garlic paste, green chillies and tomato and saute well. Add yoghurt to this and mix well. Add drained rice, water, fried chicken and paneer and mix well. Adjust the salt. Close the pressure cooker with its lid and cook for 1 whistle, switch off the flame and allow the pressure to go by itself. Soak kadala/ chickpeas in water and pressure cook it adding enough water and salt and keep it aside. Peel and chop zucchini into small pieces. Heat oil in a pan and splutter mustard seeds. Add cumin seeds, urad dal, dried red chillies and curry leaves and mix well. Add grated coconut, crushed garlic, chopped green chilli, turmeric powder and chilli powder and mix well for 2-3 minutes. Then add the chopped zucchini and salt and mix well to coat with the spices. Cover and cook on low-medium flame for 4-5 minutes, stirring occasionally until zucchini is tender. Add cooked kadala to this, mix well and cook covered on low flame for 2 minutes. In a large mixing bowl, beat butter, sugar and vanilla essence using a beater till creamy and fluffy. Then alternately add the flour mixture (in three additions) and milk (in two additions), beginning and ending with the flour and fold gently. Divide the batter into 2 parts - 1/3 and 2/3. Then further divide the 1/3 rd part of batter evenly between 6 bowls for tinting. Add different shades of food gels/ colorings in each bowl and mix until you have all 6 bright colours. Pour this coloured batter on the greased cake pop mould and bake for 12-13 minutes. ( or in the cake pop making machine and cook cake pops according to the instruction). 10. Grease 3 round 6 " cake pans and line with parchment paper or baking paper. 11. Add just enough batter to cover the bottom / base of 3 prepared pans and then place the cake balls. 12. Cover the cake balls with rest of the batter, making sure you have an even amount of batter in each cake pan. ( The remaining batter was scooped over each cake ball to cover). 13. Bake them in the preheated oven for 30-35 minutes. 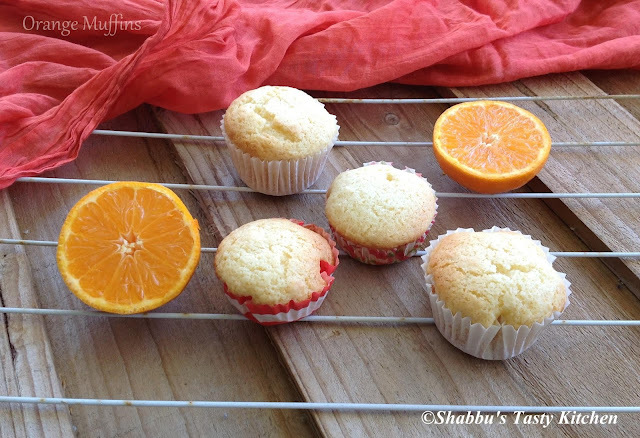 Remove cakes from oven and place onto a wire rack and let them cool completely..
14. When the cakes are cool, wrap the cakes in cling wrap and chill them in the freezer for an hour. In a serving plate/ cake board, layer the cakes and frost with a layer of buttercream icing between each layer. Then frost the outside of the entire cake with a thin layer of frosting (crumb coat) . 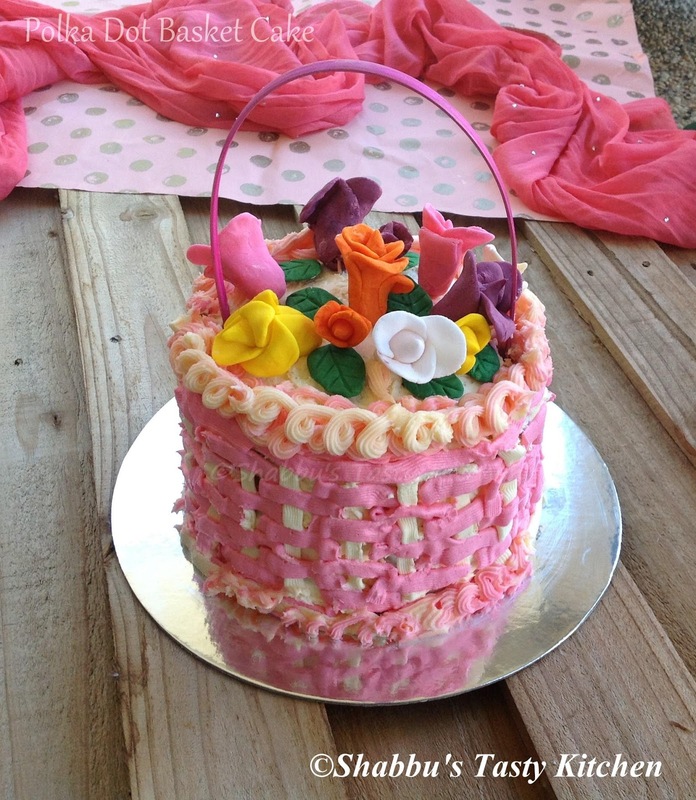 Then pipe basket weave pattern - using tip 47, start by piping a vertical stripe from the top to the bottom edge of the cake. Then squeeze horizontal stripes over the vertical stripes. Pipe a second vertical stripe over the edges of the horizontal stripes . Pipe another set of horizontal stripes between the gaps. Repeat the pattern to cover the sides of the cake as shown in link .......( Here I used pink and white buttercream frostings). 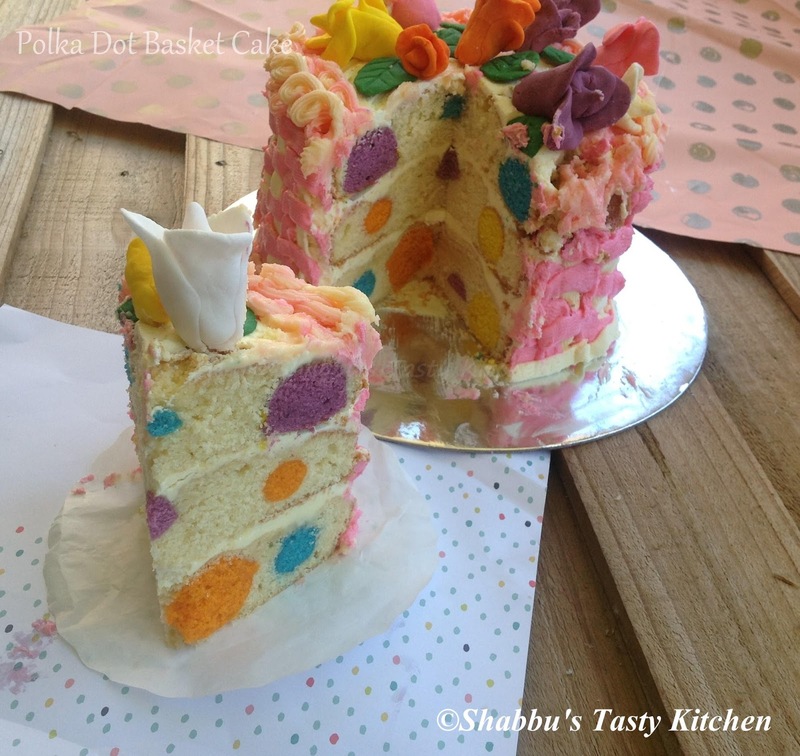 Cut the cake into slices and you can see the polka dots inside...Serve.. 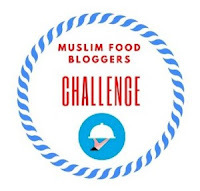 In a bowl, add the gram flour, plain flour, sugar, salt , yoghurt and baking powder and mix well. Add water little by little and make a thick smooth batter and keep it aside for 10 minutes. In a pan, boil water adding sugar. When it starts to boil, reduce the flame and add the lemon juice and saffron strands and heat it till the sugar syrup reaches one string consistency. Cut apple into thin round slices and remove the seed part (or core and slice the apples into thin rings/ rounds). Heat oil in a pan. Dip the sliced apples in the prepared batter to coat it evenly and carefully drop it in the oil. Fry them at medium flame in small batches until both sides are crispy and turns golden colour. Transfer these fried apple slices into the warm sugar syrup and let it soak for about 1 minute and then place them over wire rack to let the excess syrup to drain. In a blender, add the chopped strawberries, 1/2 tbsp lemon juice, enough sugar and puree it adding 1-2 tbsp water until very smooth. Cut the crab into pieces and clean it and keep it aside. Soak tamarind in little water and extract its juice and keep it aside. Grind grated coconut, 1/4 tsp turmeric powder and fennel seeds together to a smooth paste adding about 3/4-1 cup of water and keep it aside. Heat 2-3 tbsp oil in a pan or claypot /manchatti and splutter fenugreek seeds. Add chopped ginger, green chillies, crushed garlic and curry leaves and saute for a minute. Add sliced onions and saute well till onion starts to brown slightly. Add sliced tomatoes and saute well till it turns soft. Then add kashmiri chilli powder, coriander powder and 1/4 tsp turmeric powder and saute for a minute. Add cleaned crabs and salt, mix well and cook it covered adding 1- 1 1/2 cup of water. 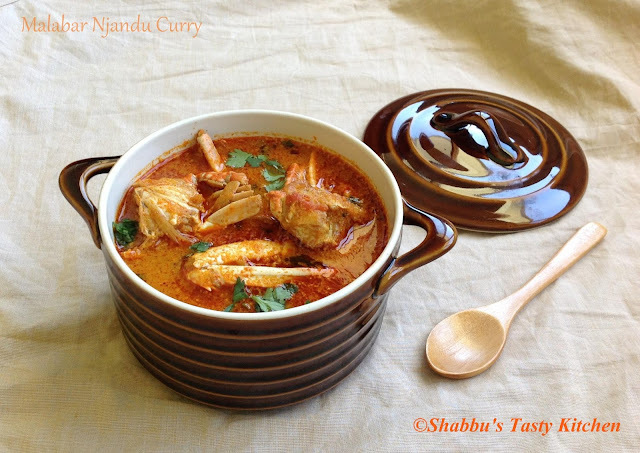 When crabs are cooked, add ground coconut paste and tamarind extract, mix it well and bring it to a boil on medium flame. In a mixing bowl, add ginger-garlic paste, finely chopped green chillies, kashmiri chilli powder, yoghurt, lemon juice, pepper powder, garam masala, red food color, salt and 1 tsp oil and mix well to make a smooth marinade. Marinate the cleaned chicken lollipops with this paste, cover with a cling wrap and keep it in the refrigerator for at least 2 hours. Take out the bowl from the refrigerator about 30 minutes before grilling. Preheat the oven and grill the marinated lollipops in the oven at 180 degree celcius for about 20-25 minutes or till done, turning in between. Brush little oil on the chicken pieces in between grilling. Serve hot..